Perfect for the BBQ or Kitchen Oven – a 15 inch diameter Porcelain Composite Pizza Stone. Allows high temperature baking on your grill. This is important when cooking Pizzas, a Pizza Stone removes the moisture from the pizza dough almost instantly, this will then give you the lovely crispy pizza base. Includes pizza peel with detachable handle and pizza cutter. Measurements – Pizza Stone: 38cm. Pizza Peel: 35cm x 30.5cm. 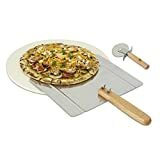 Pizza Peel handle: 20.5cm.